OCP S.A., Ed Gilbert, Naciones Unidas y Amazonas Ed. Banco La Previsora Piso 6 of. 602, Quito, Ecuador. Rainforest Information Center (http://forests.org/ric) called for a protest action defending rainforests from possible damages caused by OCP (Oleoducto de Crudos Pesados) pipeline being buit from Ecuadorian rainforest over the Andes to the Pacific coast. The pipleine should double the amount of oil removed from the Amazon. It will have a negative impact on the nature of this region. The OCP injures several national parks and endangers indigenous communities of Indians living there. The OCP project is being financed by Westdeutsche Landesbank (WestLB) of which 42% shareholder is Rheinland-Westfallen. We urge WestLB to review its policy and to withdraw financing OCP. 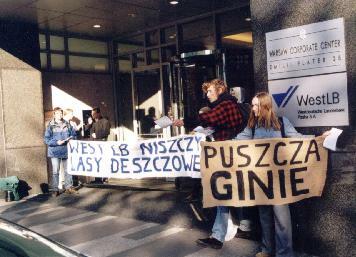 "Workshops for All Beings" called for a protest action on 24-th October 2001 11:00 before WestLB office in Warsaw at ul Emili Plater 28. Actions are planned before WestLB offices also in Sydney, Los Angeles, Washington, London, Münster, Quito, Düsseldorfie, Munich, Zürich, Milano and in Amsterdam. the police shifted the time of our protest by 3 hours, arguing this was necessary due to a fireman test, which we were told did not take place. we don't know if their motive was to "discharge" the protest meeting, and if it was good to agree with this time shift. nobody bothered about needed WestLBs' confirmation to receive any letters before the protest. 10/23 WestLB denied by phone that it had received any ask to define their position. Yet during the protest WestLB confirmed that it had received our e-mails. we didn't ask at thie right time to speak to the office director at 10/24 and we don't know the position of a person we spoke to. we had no full control of what mass media will come. The time of a protest in Warsaw has been changed by the police from 11:00 to 14:00. From 14:00 to 15:00 ca. 12 people protested before WestLB office with banners. Radio Praga Plus Broadcasting recorded two interviews with protesters (not with people from the bank). The representative of "Pracownia" (Workshops) demanded to speak to the WestLB office director. The representative of WestLB Mr.Jarosław Lejko confirmed to receive a written protest letter and he passed on to the protesters the press release of WestLB head-office from 8/28/2001 in which consultations made before project begun are listed. Mr.Lejko passed on also a printed assurence from 10/24 that WestLB Poland SA.is not involved in financing the project in Equador. This assurance was signed by a board member Mr.T.Maciejewski. Apparently the Embassy met with a delegation of activists from National and International organizations while about 25 or 30 people protested outside. The Embassy staffer seemed well aware of the issue and some what in agreement that the OCP project would not meet German environmental standards from the Federal Gov't perspective but pointed out that the issue involves a regional bank and State government. He did agree to send a letter within the next several weeks to West LB and state NWR folks informing them of the protest and the meeting and mentioning that a delegation visit by the Bank officials is requested to the area. Also, the VP of Ecuadorian Congress came to this meeting in support of the Activists and he is working on a formal invitation for a delegation to visit the route to be sent to West LB and State officials. Quito, Ecuador, - Leaders of CONAIE, representatives of the Vice President of the National Congress, community organizations, and Ecuadorian and international environmental organizations met with the German Ambassador to Ecuador, to present their concerns over the social impacts and environmental destruction which the construction of the new Heavy Crude Oil Pipeline (Oleoducto de Crudos Pesados - OCP) will cause. On June 10th of this year, OCP signed a 17 year loan agreement for $900 million with Westdeutsche Landesbank, the largest German bank which uses public funds. The demands of the organizations are: the complete suspension of the loan and the participation of government and West LB delegates in a visit to the affected areas. They also demanded consistency with the speeches of the coalition of Social Democrats and the Green Party currently heading the German government, supposedly committed to the environment. For example, Germany, in signing the Kyoto Protocol, committed to diminishing CO2 emissions. This is completely inconsistent with the decision to commit public funds to an activity oriented towards the extraction of more petroleum, one of the major contributors to global warming, exacerbated by the fact that this petroleum would come from the tropical forest of the Ecuadorian Amazon, with its indigenous territories and extremely fragile protected areas. Wyrażamy swoje zaniepokojenie faktem, że Westdeutsche Landesbank uczestniczy w finansowaniu projektu Oil Crude Pipeline budowy ruroci?gu w lasach deszczowych w Ekwadorze. B?dzie on przebiega? z Puszczy Amazo?skiej przez Andy a? po wybrze?e, przecinaj?c wiele parków narodowych, rezerwatów i innych cennych przyrodniczo terenów, stanowi?c bardzo powa?ne zagro?enie dla ?rodowiska. Zwraca si? uwag? na to, ?e teren, na którym planowana jest budowa, nie jest odpowiedni dla tego typu inwestycji ze wzgl?du na mo?liwo?? obsuni?? ziemi ze stromych, niestabilnych zboczy. Planowany ruroci?g na swojej znacznej d?ugo?ci b?dzie równoleg?y do ju? istniej?cego ruroci?gu SOTE, który przebiegaj?c przez tereny zagro?one trz?sieniami ziemi, 48 razy mia? awarie, w wyniku których zgin? ?o 30 osób, a do rzek, lasów i na tereny uprawne dosta?y si? 74 miliony litrów ropy powoduj?c ska?enie ?rodowiska. Nie do zaakceptowania jest fakt, ?e publiczny bank udziela po?yczki pod inwestycj?, która nigdy nie zosta?aby zaakceptowana w Polsce czy w Niemczech ze wzgl?du na zagro?enie dla zdrowia i ?ycia ludzi, jak równie? dla ?rodowiska naturalnego. Projekt budowy ruroci?gu nie by? konsultowany ze spo?eczno?ciami lokalnymi w Ekwadorze, co w Europie jest norm?. Co wi?cej, jest on realizowany pomimo stanowczych protestów mieszka?ców tych terenów. Stanowczo nalegamy na wycofanie si? Westdeutsche Landesbank z finansowania projektu, który stawia pod znakiem zapytania wiarygodno?? banku. WASHINGTON, Oct 25 - Scores of demonstrators turned out in more than a dozen capitals across Europe and in the United States and Australia Wednesday to protest the involvement of Germany's largest publicly held bank in a controversial oil pipeline project in the Ecuador's Amazon region. Supporters and representatives of indigenous groups which actively oppose the project also marched before the German Embassy in Quito, Ecuador, to press WestLB--the lead bank in a consortium of lenders which is providing nearly US$900 million in financing for the 300-mile Oleoducto de Crudo Pesado (Crude Oil Pipeline), or OCP--to pull out of the project. The proposed OCP will stretch from the Ecuadorian Amazon to the Pacific Ocean, passing through several indigenous territories as well as ecologically fragile protected areas, such as the Mindo Nambillo Cloudforest Reserve, one of the world's premier bird sanctuaries. "The pipeline affects 11 protected areas and is a threat to endangered species and critical rainforest ecosystems of global significance," said Kevin Koenig, a campaigner for Amazon Watch, a California-based group which co-sponsored this week's demonstrations. The government of Ecuadorian President Gustavo Noboa has defended the $US1.1 billion project as essential to jump-start the country's long-troubled economy. Ecuador's oil production, which has lagged in recent years, will double once the crude starts flowing through the OCP to the country's Pacific ports. But critics argue that the costs to Ecuador's indigenous cultures and unique ecologies will be too great. Pipeline spills would risk despoiling potential eco-tourism spots and construction of the pipeline itself will likely draw settlers who may clash with the indigenous groups and exert unsustainable pressures on the fragile rainforest ecologies, according to the critics. But Noboa and the chief investors in the project--Canada's Alberta Energy, Spain's Repsol-YPF, and U.S. companies Occidental Petroleum and Kerr-McGee--have vowed to go forward with it. "The pipeline will be built, and that is final," Noboa said last May, after his own environment minister criticized it. "I am not going to let them mess things up for the country [just because of] a handful of idiots." WestLB's status as a publicly held bank--the government of North Rhine Westphalia owns a 42 percent share--has spurred debate about whether it should be involved in a project which is potentially damaging. Green Party members in the state parliament and even the state's environment minister, Baerbel Hoehn, have spoken out against the bank's participation. The bank's consortium partners -- notably J.P. Morgan Chase, Citigroup, and Deutsche Bank -- have also come under pressure from northern-based groups. In a letter sent to each of them last May, a coalition which included Amazon Watch, Oxfam America, Greenpeace International, Friends of the Earth (news - web sites), and Rainforest Action Network, called on the banks to withhold loans until a comprehensive and independent international review of the environmental and social impacts of the project could be carried out. Indigenous groups, including the Indigenous Nationalities Confederation of Ecuador (CONAIE) have brought lawsuits against the project. Last week, dozens of protestors mounted peaceful blockades to stop construction. Wednesday's international protests, which were held in San Francisco, Washington, London, Munich, Zurich, Warsaw, and Sydney, among other cities, were carried out in solidarity with them.